Ukrainian President Petro Poroshenko says Ukraine and Georgia have received a signal from the European Union about the prospects of the introduction of a visa-free regime. "We have [received] a strong message that the EU welcomes the success of Ukraine and Georgia in the liberalization of the visa regime with the EU," Poroshenko told reporters after the Eastern Partnership summit in Riga on May 22. Poroshenko said there are no political obstacles in the issue of the provision of a visa-free regime with the EU. "We have now removed all political obstacles to a visa-free regime," the president said, responding to a question as to what Ukraine will do to ensure prompt introduction of visa-free regime with the EU. 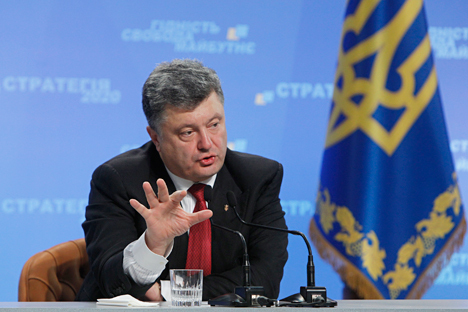 Poroshenko added that "solely technical issues remain to be resolved to achieve this goal." The president said the next European Commission report on the fulfillment of the action plan to liberalize the visa regime with the EU will be ready no later than December 15. "We will do everything to implement that [the necessary reforms]," Poroshenko said. Poroshenko added that issues relating to document security, the creation of effective databases, migration management, and the fight against crime and corruption remain to be resolved. "I have set the task until June 10, I will hold a meeting and we will coordinate these actions [to meet the criteria for a visa-free regime]," Poroshenko said. Poroshenko said he will do everything possible to achieve a positive result as early as in September 2015.